'Tis the silly season and I'm pretty happy about it. The countdown is now on. But unlike my childhood years my christmas excitement is less directed towards christmas morning and presents from Santa, and more about the days surrounding the 25th - family arriving from different corners, lots of food to cook and enjoy, reunions with old friends returning to their home towns, and lazy post-christmas-day holidays spent eating left overs, lapping up some sunshine and reflecting on what's hopefully been for all - a pretty good year. There are always a lot of people around my family christmas, and there's one thing my mother has taught me about hosting guests - there should always be a platter! Growing up, whenever we had visitors (at any time of the year), my sister and I were on lock down. Before guests would arrive, no one could leave the house until every room was spring cleaned - bathroom taps polished and dust out of all the cracks and corners and all. This mad cleaning schedule meant that by the time people were arriving Mum was literally jumping through the shower and getting herself ready as they were walking up the drive. And so, it became my job to put together a platter of delicious nibbles, because there was absolutely no time left for Mum to do it, but she insisted we couldn't possibly go without. And so, with the fridge at my disposal I could put together my own foody-work-of-art - which at age 12, made me feel quite grownup and important. Many years on, if I am at home and we've friends coming over, by default it is my job to put together a platter. So with christmas at my parents just around the corner and more family visitors and guests popping in then you can count - it is crucial that the fridge is fully stocked with platter goodies. 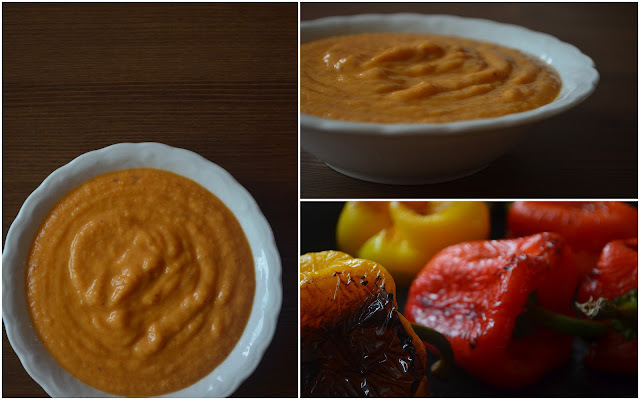 This year I plan to make up a few bulk pestos (check out two I've whipped up here and here), a classic hummus and then one dip that is a little different - roasted capsicum and coconut dip. That way I know I'll be prepared the minute someone walks in the door. I can throw together a selection of dips, some crackers or crunchy bread, some cheese if I fancy and I think I'll have myself some happy customers. The flavour combo in today's dish is quite special. The sweetness of the roasted capsicums sit so beautifully with the creamy coconut - it gives off quite a thai-style flavour burst. It's super easy to put together and if you make a load of it, you'll find yourself grabbing it from the fridge for more than just a platter essential - I love to throw it through some pasta as a quick and easy sauce, (if you try my zucchini fettucini recipe, it works well as a replacement for the pesto and completely changes the dishes taste-profile). I also like to have it on hand for a mid afternoon snack with some freshly chopped vegetables. Heat oven to 190 degrees Celsius. Prepare kumara and place in a roasting dish with a little olive oil. Rub the capsicums with your choice of olive or coconut oil and place in a separate roasting dish. Put both dishes in the oven. Leave the Kumara till it turns golden and starts to crisp (about 20 minutes), remove from the oven and leave to cool. Check Capsicums after 15/20 mins and turn them. The bottom side should be turning a dark roasted brown colour and starting to blister. Continue cooking and turning till their whole surface has taken on the blistering brown complexion about 40-50 mins (see pictures above and below). Remove from oven and leave to cool. If you have the time, cover them while cooling as this will help them sweat and make their skins easy to remove. 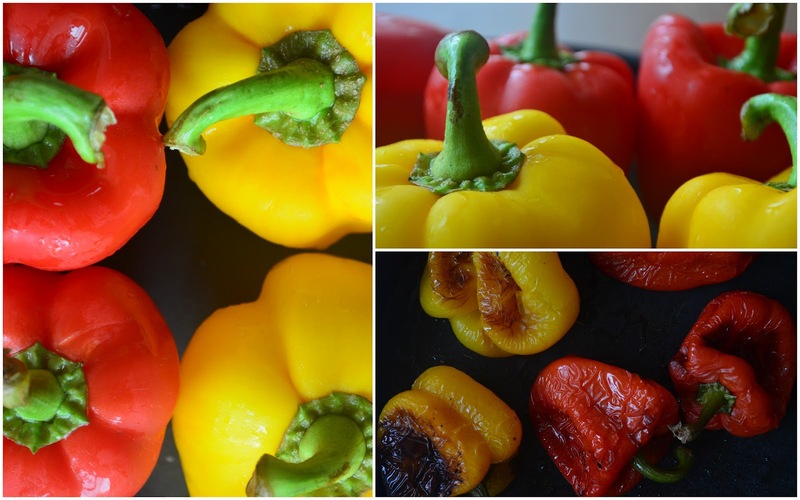 Once the capsicums have cooled to at least room temperature peel their skins and remove their green stalk and seeds. Add the capsicum flesh, along with the roasted kumara, garlic, salt, lemon juice and optional chilli and coconut oil to a food processor. Pulse and blend till all ingredients are well combined. Next add the beans and coconut cream and blend together. Leaving the food processor on slowly pour oil through the top shoot. Turn off the processor and try the mixture. Let your tast buds decides whether it needs a little more salt, chilli or water to thin the consistency. I like this dip quite smooth and velvety, so leave the processor running for a few minutes, but it is delicious left chunky too. You may need to help your food processor along and mix in any ingredients that run up the side of the bowl. I love whipping this out for my friends as it has such an interesting flavour and is something a little different to add to your christmas menu!